Home » Site Updates » Podcasts » WTF @ TCG Podcast Interview Now Online! WTF @ TCG Podcast Interview Now Online! 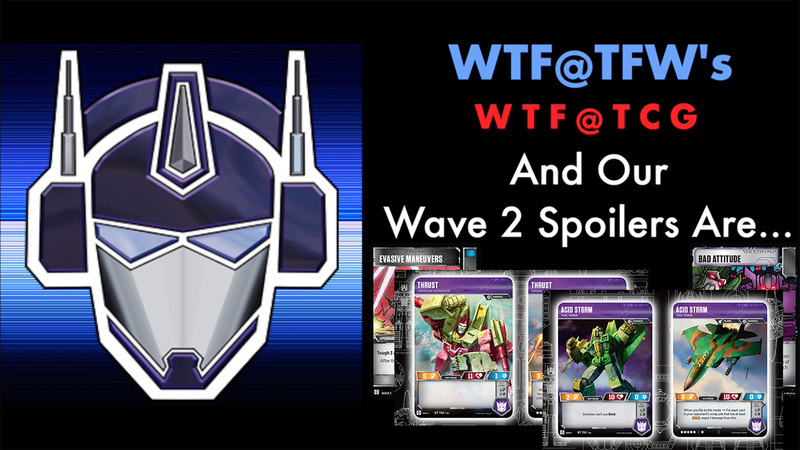 The WTF@TFW Podcast crew has something special in store for listeners this week! Two brand new interviews are up for your listening pleasure here and here. The Thrust combo seems pretty fun. Add an Autobot Leader with a Matrix for a bigger buff perhaps? Sorry about that. It floated more into a deck tech style video after our reveals. Was there anything specific that we passed over too quickly? There isn't much you can do about speculative tech talk about new mechanics. I guess I was thinking in terms of something more rounded than focused coverage of the reveal. This one felt a little to heavy on shorthand for the uninitiated. Acid storm is very interesting. I am really pumped for this set. Nice. Hasbro and Wizards are really doing something special with this game. I like some of the new titles for moves. Plan and Brave so far. I really need to learn how to play this. I buy a booster every so often. It's time for our WotC-provided Wave 2 spoiler cards! Two characters, two battle cards, two podcasters, four reveals! All in under half an hour!